It seems American kids aren't the only ones growing at an alarming rate. And by growing, I mean putting the padding on or, in laymen's terms, getting fat. The disturbing trend has moved at least two mega-profile individuals to doing something about it. First-lady Michelle Obama has made it her life's work to bring childhood obesity to the attention of the American people. And "Naked Chef" Jamie Oliver has just launched a weekly American television show aimed at getting kids to eat right. 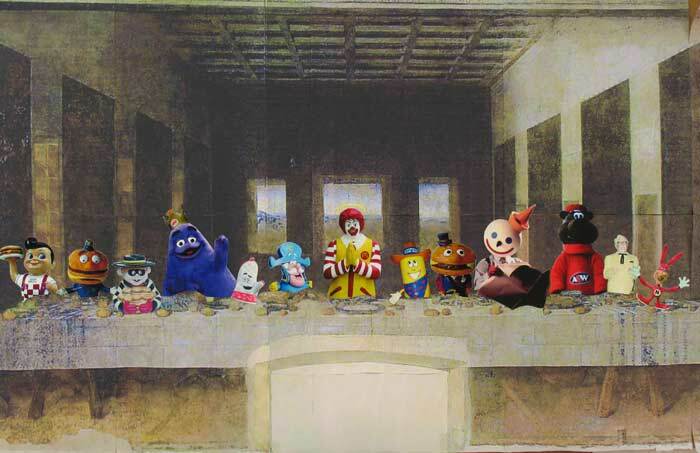 As we approach Easter this week, seems there were more miracles going on at The Last Supper than we knew about. 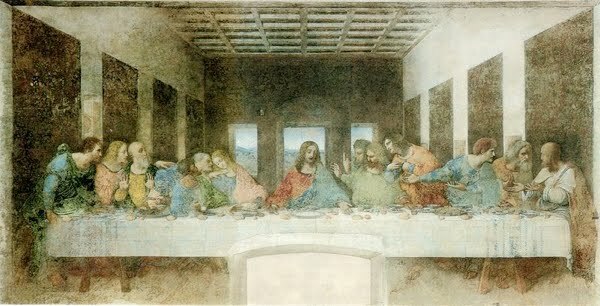 The initial visual documentation of the most famous dinner ever - "table for 13, right this way" - was preserved by Leonardo da Vinci in the 15th century. But now it seems subsequent renderings have resulted in more food on the table. A study by 2 professors at Cornell University has discovered that down through the years, reviewing over 50 subsequent paintings of the last supper, the plate sizes and the portions of food on the plates have grown by up to 69 per cent. Art would seem to imitate life. Doesn't surprise me at all. I think that Jesus actually stashed a Snicker or two in his robes on his trip through the desert. How else could he have survived? Don: A Sweet Marie would have kept him happy, if you know what I mean- nudge, nudge ;) ;) . Holy Ronald McDonald! Even though most fast-food places now offer low-fat alternatives, such as wraps and salads, to their not so Happy Meals, have you seen the calorie count for the salad dressing? Sheeesh! Me-Me: Yeah and I just read something about people who fool themselves by choosing the so-called low-fat salad item smothered in bacon bits. Ha, ha. Howdy! I'm over from CCWA and what a great post over there! You just painted my picture except the scotch would be a glass of wine. Our American servings truly are a testament to the obesity fad we've got just about sewn up over here. It always amazes me that the Europeans are not bursting at their literal seams because in most countries over there, it's all about the food. But, then you look at the food content, fresh, fresh, fresh, with very little in the way of processed foods and the fact that their servings aren't enormous and you have the secret to thin. I've never seen a Golden Corral in any of my travels over there. Happy CCWA day! Great post (and point) over there. I feel like I'm standing on an Internet street-corner most days with a will write/draw for comments sandwich board, being shuffled between the store closing flippers and the end of the world dudes. 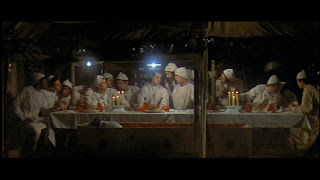 Just heard about the super-sized Last Supper phenom via the Wait, Wait... Don't Tell Me! Podcast. How utterly bizarre. And in related news (@Joann, too) the NPR Food podcast highlighted that New York schools' home-made bake sales are limited to once a month because they can't guarantee the quality of the items being made available whereas you can fund-raise with pre-packaged (and loaded with chemicals and preservatives) foods as much as you want! Canadian Blend: I didn't want to say anything. Why do you think that is? Joann: Thanks for coming by, ma'am. Yeah, the Europeans love to eat and drink but somehow keep the weight off. What's a Golden Corral? Scraps: Good "want comments" analogy! That bake sale story is too much. But it's changing. I read where Pepsico and Kraft are reducing salt in their products soon. Gosh, there'll be no fun in pigging out anymore. Loves it. Especially the Star Wars parody. I could totally see that hanging in my living room if my husband ever got a hold of it. I don't know why eating is of such HUGE importance in our today's society....Eat to live, don't live to eat, gosh! Salt: Those are just a fraction of the Last Supper parodies on the net. Funny stuff. Thanks for drop[ping by from CCWA! I'm here all week! BlackEyedDog: But that's the point. Why do so many people overdo it? I think it's in their jeans. Well it is after they overeat ha, ha. idifficult: For some reason I have this vision of Edward G. Robinson in the Ten Commandments. Americans kids are fat? Really? I thought they were future football players. Who knew? I'll be damned! Mike: Watchew talkin' 'bout Willis!? Can you get that Ronald McDonald Last Supper picture on black velvet? CL: Black velvet goes without saying. Adds a bit of class to the proceedings...if that's possible.